Pleasant, vaguely Englishy city, complete with Avon river. Nearby Lyttleton is the settlement site of first four ships to Canterbury. Major business centre of the South Island. Free-draining stoney ground that grow lovely Oak trees, rose gardens and wheatfields. Stable and reliable location for business, academia, and manufacturing. Nice place for old white haired people to retire to, in crispy sunshine. Not many brown people for those that are scared of them. Lovely old buildings giving authentic sense of heritage. Lots of Churches give it a god-fearing atmosphere. Lots of roads on which to drive a hotted-up car. Good business with tourists, especially Japanese, who come to get married in old churches and see penguins in Antarctic Centre. Pleasant, vaguely Englishy Quake-ridden hell-hole city, complete with silted-up Avon river. Nearby Lyttleton is the settlement site of first four ships to Canterbury destroyed. Major business centre of the South Island. No chance of much business happening for quite some time. Free-draining stoney ground that grow lovely Oak trees, rose gardens and wheatfields. Nasty silty liquefaction everywhere, and the pollution of farmland with dairy cattle. Not many brown people for those that are scared of them. Not many people at all, really. Lovely old buildings giving authentic sense of heritage. Old Dungas are history. Lots of Churches give it a god-fearing atmosphere. Sorry, no churches left. Lots of roads on which to drive a hotted-up car. Low-slung suspension not working quite so well on those metre deep potholes is it? The Old Heritage Buildings are – well, basically, gone. Or going, going, gone, if not Gone yet. Hell hath no fury like a Brownlee in possession of a bulldozer. D – For the last 2 months, and next 2 years, you probably can’t even get to the buildings anyway. The Middle-aged, Middle-sized buildings are munted (the word does seem appropriate to me – ie drunken, stumbly, and unpleasant to be around). So: is there any point in the city hanging around? There are a number of empty shops elsewhere in the country – in Wellington, in Auckland, in Dunedin, in Otarahanga. Would it not be better to export the people from Canterbury, and install them into the cities that need them here in NZ, rather than let them go off to Oz and pay taxes there? We’ll have the hard-working entrepreneurs here in Wellington please! Auckland can have the bogans! If they are going to take 2-10 years to rebuild and reopen the central city, is there really any point in the CBD being rebuilt at all? Haven’t all the shoppers gone to shop in the suburban mega-malls anyway? (Although, several of those are pretty banged up / closed down as well). We’ve had ghost towns before – places like St Bathans in Central Otago, once used to have 4000 miners and 40+ pubs – now has a population of 1 pub and about 20 people. Blackball, on the West Coast, has 1200 people and now has only a few handfuls. Detroit, a city of nearly 2 million in 1950, now has only about 700,000 and is steadily dropping still. Are we too scared to even discuss the undeniable fact that Christchurch may be – shock – horror – not worth the effort? Should this town be coming like a ghost town? If Christchurch was to become a ghost town, I think it would probably end up more like Thames – a former big ol’ boom town that downsized to a large town after the boom went away. Not a blip on a map, but still a shadow of its former self. Dunedin used to be the largest city in New Zealand before its boom died. It still feels like a big, old city, complete with a grand cathedral, museum and town centre. Meanwhile Hamilton, a larger city now, still feels like a provincial town. Maybe Christchurch will end up reverting back to a 1950s style city, where everything is lovely. Or perhaps it will be the Tauranga of the South Island – a port, oldies, and boy racers. Oh, you know what? If we’re going to be looking at “Ghost Town”, let’s look at the town they were singing about – Coventry. It had its heart bombed in World War II, but managed to build its way back and keep things humming (though, obviously, things weren’t so great in the early ’80s for that song to be written). In ghost towns made the end of a mining boom, the departed residents were only there for the money, anyway. And they left to go on to find their fortune in other places. Meanwhile, places damaged – either by natural disasters or war – tend to be inhabited by people who want to live there, who like living there. So the residents want to keep living in that town. So I think there’ll always be people willing to live in Christchuch. It’s the mobile gone-by-lunchtime types that are going to take the edge off Christchurch. If I were from Chch I’d be a bit offended at this post Max. Even if you’re being ironic it’s a bit on the nose. Personally while I don’t want to go there and get in the way I’m keen to see what vision springs up from the ruins and I keep in mind that if Nature wants to throw a 7.2 Richter Scale spaz we’re only a few minutes away from a similar or worse fate. I was talking to a cop two days ago who was there last week and he said something I’ve heard before ie “..it’s a lot more f*cked than it looks in the news pics” so steady on Max- it’s as if someone were to call you an amphibian rather than the fine finned dish that we all know you are..
Robyn, thanks for your well thought out and measured comments. Good, wise words, as always. 60, thanks also for your honest assessment of my remarks. Yes, I’m sure folks from down South may well be offended. My point was not to offend, but just to open discussion on a delicate subject. I think I would be saying the same about Wellington if something similar happened here. If we had a massive quake here, right now in Welly, as you’ve said before yourself, we’d be in deep trouble. Imagine if our CBD was closed off for months on end, and all the business and Gov departments were moved out of town to Auckland. Would we ever really get the city back? On the other hand, imagine if we had the time to prepare our city, to get it ready for the Big One, so we could just ride out the shake and shrug it off, with no loss of business or loss of life. Well, we do have that time if we work fast. Wellington could survive if it chose to plan ahead right now. We need to not sticker buildings with notices that say Repair by 2025. We need to start the process now. – An under-cover fresh-produce market. Fresh bread, coffee, cheese, meat, wine, veges. – An earthquake museum and an earthquake simulator would attract visitors, and position Christchurch as a world leader in seismology and recovery. – A central-city refuse station, with methane extraction to power/heat the CBD. – I want to see Weta Workshop design a CBD mall. – Embrace the Avon River as the Dutch do their canals. – A Chinatown (in the central city) … or in some of the derelict buildings of Sydenham. – Divide the ages. Create a place for youth and then another place for older shoppers. It will solve the age dispute. That list is a depressingly dull stretch of the imagination of things to do – including the inevitable request for Weta Workshop to take over design of their reality. Sigh. And yes, undoubtably there will be an earthquake museum (although I’m not sure that a simulator is necessary right now, as they still seem to have the real deal happening daily…). I think the problem is there’s still a lot of people living there with houses that are largely unaffected or which can be repaired. What can you do about that? There’s nowhere else in the country to put those people. Does it make sense to build 100,000 new homes for them somewhere else, or to leave them in the homes they already have? Or you could say – if 100,000 homes are to be rebuilt, where is the best place to rebuild those houses? 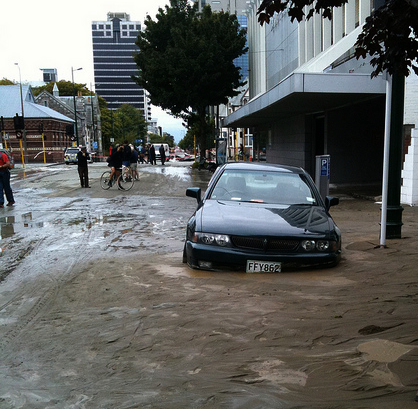 Certainly not in the mud-strewn, liquefaction-prone East. We have a massive amount of empty, unused, unsettled land in NZ – they could be rebuilt anywhere. Dunedin could do with a few tens of thousands more people – as could Invercargill. I’d love it if they came up here, but given our propensity for quaking, we all know that ain’t gonna happen. 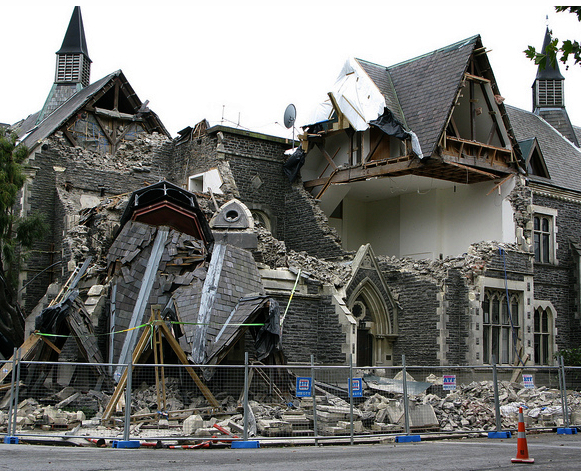 The fact of the matter is that Christchurch needed rebuilding even before the earthquakes. Its reliance on the car with the growth of suburban shopping malls and failure to develop inner city living meant that any vibrancy the central city had was false. It was an artifice built around the tourist trade and the historic buildings. Apart from these things the city had been gutted. There is now an opportunity to redress the situation; to create a living city centre. And press reports suggest that is what Ian Athfield has in mind. Aren’t most places in NZ are prone to some form of disaster? Wherever you build / rebuild these likelihoods need to be factored into the design. Might as well make the most of what assets Christchurch has left and rebuild around them – futureproofing the city as much as possible for the next disaster in 50-100? years. A golden opportunity, and hopefully the reality in 5-20 years is somewhere close to the potential…. wishful thinking maybe. 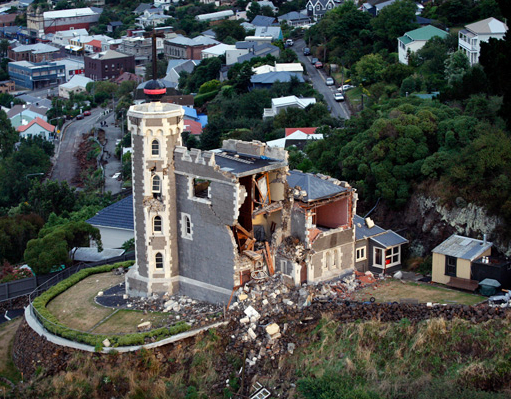 I’m a Chch local who visits and enjoys wgtn CBD regularly but I seriously hope that i’m not in wgtn CBD when your big quake hits… Agree that you need to start fast tracking your quake preparedness ASAP. The Terralink video footage from this site is really spookily interesting to watch – http://eqstreetcam.co.nz/ as it shows the CBD, at present a total ghost town with very few people present. I would have thought the CBD would be swarming with people actually doing something – ie either tearing buildings down, making things good, moving gear out, rebuilding etc – but no, there’s nothing but a Government-enforced idleness. A tragedy of inaction. Maximus: “Or you could say – if 100,000 homes are to be rebuilt, where is the best place to rebuild those houses?” But isn’t there only something like 10,000 – 20,000 homes needing complete rebuild? Certainly agree though, they will need to manage the rebuild smartly, and make some decisions to abandon whole suburbs in some cases, so as to avoid creating wastelands. Yeah that eqstreetcam is a bit of an eye opener. Clearly WLG would be f#!&ed with that strategy. Just think about all the people living in the CBD, and all the people we’re trying to shift into the CBD over the coming decades. We need to ensure the CBD is resilient so people can still get around and function and stores that are able to open can reopen, etc. Certainly there needs to be more emphasis on upgrading those buildings liable to fall face first onto the street.. but it’s a couple of months on now so everyones lost interest (amazing how quickly that happens!) and it’ll probably just get swept under the carpet again. Chinatown in NZ’s supposed skinhead capital. You’re havin’ a larf. Yes, indeed, you’ve spotted the fatal flaw in their argument… of course, Chinatowns are seen as a “nice” way of having ethnic food all in one place in the city, while giving no credence to whether the Chinese actually want to live and work there….. I suspect that Chinatowns used to work well when Chinese were poor illiterate labourers in dingy yum cha kitchens – now that the Chinese are the hard working upper-middle class, all growing up to be Doctors and Physicists, and driving stretch Lexuses with diamond necklaces – let’s face it they are not going to want to join a sweat shop in Sydenham. An international expert in disaster recovery is shocked at the slow pace of deconstruction work in Christchurch’s quake-damaged central city and is questioning why demolition crews are not working weekends. “Teams should be working seven days a week,” Cameron Sinclair, chief executive of the international agency Architecture for Humanity told the Sunday Star-Times during a whistle-stop visit to Christchurch. When the Star-Times visited the red-zone last weekend, machinery was sitting idle and there was no demolition work under way despite the perfect weather conditions. The explanation given for the lack of activity was that by the weekend workers were so tired it became “almost dangerous” to continue. But Sinclair, who helped with the rebuild of New Orleans after Hurricane Katrina, said the city could not afford to take weekends off when there were so many buildings that needed to come down before any reconstruction work could begin. 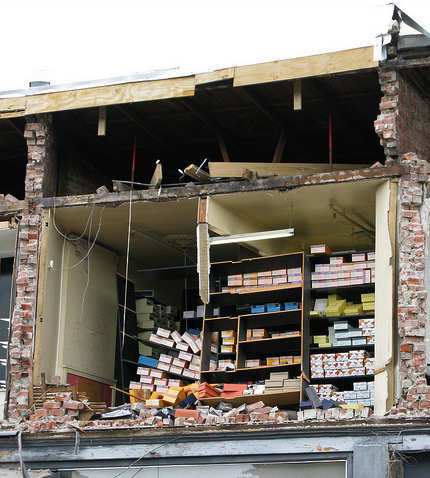 The Canterbury Earthquake Recovery Authority (Cera) has identified around 1000 buildings in Christchurch’s CBD which need to be demolished. Sinclair said Cera should be negotiating with contractors that they worked seven days a week – even if it meant having to take on more staff. “It’s almost like putting on a world cup right? You have a deadline and you hit it. People get bonuses if they make a deadline and they get fired if they don’t. Think of this like putting on a huge event, but the event is the rebirth of the city,” he said. A spokeswoman for Cera said as an increasing number of buildings were signed off for demolition, the authority expected to see contractors working longer hours and over the weekends. She said there was no confirmed timeframe for completing the deconstruction process. Demolishing the Grand Chancellor alone would take about a year. Plans for demolishing the multi-storey hotel were announced last week. It will be pulled down floor by floor, starting in the next few weeks. Earthquake Recovery Minister Gerry Brownlee said it was very important to get big demolition jobs done because the sooner buildings like the Grand Chancellor were down, the faster Cera could move to reopen areas and get on with the rebuilding.